Spoon the dry cookie mix into the Bisquick™ Shake ‘n Pour™ container. Add the water and shake until smooth. Spray a round waffle iron with non-stick baking spray and preheat the iron. Pour a small amount of the waffle mix onto the hot waffle iron. Let the first waffle be a test, adding more water if needed to make the waffle mix smooth and thin enough to spread across the entire waffle iron. Cook waffles according to waffle iron directions until golden brown. Remove and cool just enough to handle, then place a wooden stick (such as a wooden spoon handle) in the center of each waffle and gently fold the waffle over it to form a taco-style shell. Allow to cool completely in this shape. 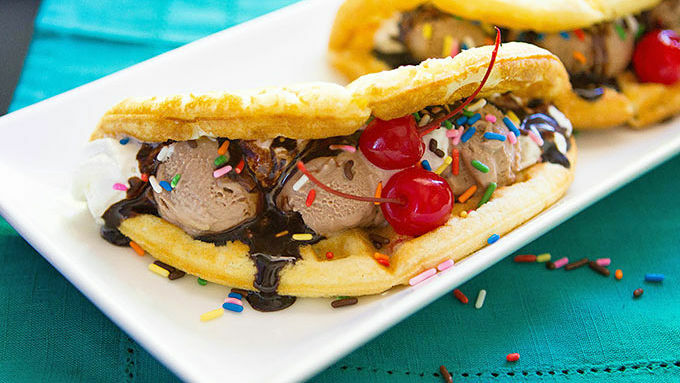 Fill each cooled waffle shell with small scoops of chocolate ice cream, drizzle with fudge sauce, and top with whipping cream and sprinkles. Add cherries, if desired. Serve immediately. Looking for a shortcut? 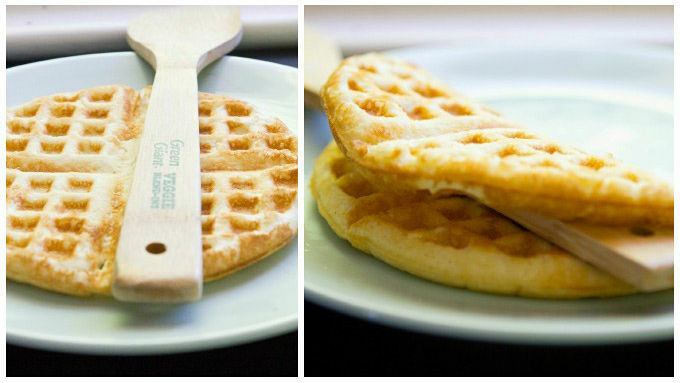 Use premade frozen waffles, instead to get the same fun snacking experience! Let your waffle iron make this sweet chocolate ice cream treat! The Choco Taco, a longtime fave treat, is the inspiration for this scrumptious homemade version! Your summer is about to get deeeelicious. Waffle Mix + Sugar Cookie Mix = Taco YumYum. This recipe is seriously so easy. 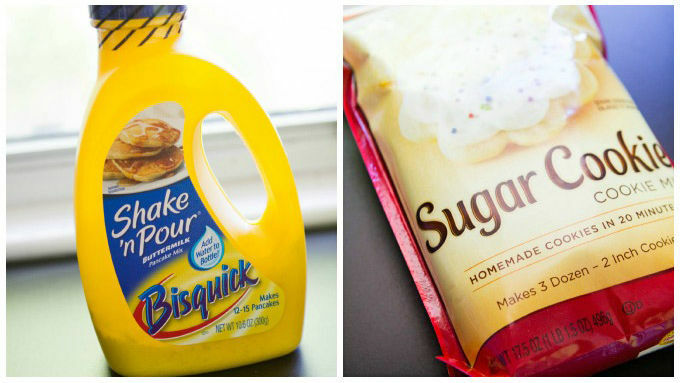 Sweeten Bisquick Shake-and-Pour with a bit of sugar cookie mix. Shake. Prepare to pour. Sugar-cookie flavored waffles. Yah. Next: Waffle iron needed. Now here’s a little secret from my kitchen to yours: Before this recipe, I had no waffle iron. A quick run down to my local thrift shop and I came home with one of those classic round-shaped waffle irony things for just $2.99. Bazinga. Once you have enough waffles for a party, you can plop scoops of chocolate ice cream into the center of each waffle shell. Top with whipped cream, chocolate sauce, cherries, and sprinkles, and it’s PARTY time!